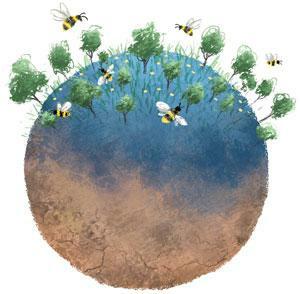 Why do conservationists hide when the bees dwindle? Pollinators are the key to sustenance of terrestrial life on the earth. Yet, in India there has been little effort by policymakers, researchers and politicians to conserve them. Even farmers, whose life and livelihood depend on pollinators, are unaware of their significance. Growing up, I remember my grandmother repeatedly telling us, “Don’t kill the bees. Killing one bee will bring upon you the same sin as killing seven cows.” It did not make sense then. The bees are small and insignificant, but cows are an integral part of the household. They give us milk, butter and curd. But, I guess, wisdom skips a generation. Like my parents, many farmers I met during my field work in Sikkim are unaware of the significance of bees. Dhan Bir, a farmer from Pakhigaon, West Sikkim, thinks bees steal nectar from flowers and make mandarin oranges on his land sour. Many other farmers believe that bees cause the fruit to fall. Very few know about the valuable pollination services the bees provide. In the pursuit of nectar, pollinators, such as bees, butterflies and flies, move between flowers transferring pollens grains from one plant to another in a process known as pollination. Every third bite we take comes from an animal-pollinated plant; bees form 90 per cent of these pollinator troupes. Pollination is responsible for three- to five-fold increase in the fruit yield of many plants, including apples, oranges, mangoes, avocados and several vegetables. But in the recent past, dwindling bee numbers in different parts of India have been reported. In April, which is the flowering season, Ravi Thakur paid Rs 20,000 to beekeepers for installing beehives in his apple orchards in Thaknal village of Himachal Pradesh’s Kinnaur district. There are approximately 1,400 fruiting apple trees in his orchard, and Thakur has installed 25 bee boxes. The beekeepers charge Rs 800 for each box per flowering season. Since the apple flower is self-incompatible (it does not take its own pollen for reproduction), its dependency on pollinators is high. But, Thakur says, rampant use of pesticides and insecticides has killed bees, butterflies, moths and all insects in his orchard. The government has further added to the misery of native pollinators. To compensate for the loss of pollinators, the Indian government has encouraged rearing the domesticated western honeybee (A mellifera). Studies report that the exotic A mellifera competes for floral resources with native bees, leading to their disappearance. This decrease in pollinators has forced farmers in Himachal Pradesh to rent beehives from Rajasthan, Haryana, Uttarakhand, Punjab and Uttar Pradesh for pollinating apples. The introduction of A mellifera in Himachal Pradesh and elsewhere in the country reflects the unidirectional nature of agricultural decision-making, which often excludes farmers and scientists. While the introduction of A mellifera has improved the fruits and stabilised the yield, the government did not even consider its effects on native pollinators before making the decision. Increasing dependence on monoculture crops and pressing single bee species into action is one of the factors responsible for the declining number of bees across the globe. Examples can be seen in the US and parts of Europe where Colony Collapse Disorder (CCD) has disrupted bee population. CCD happens when the majority of worker bees disappear from beehives, leaving behind the queen bee and a few nurse bees to take care of the eggs and immature ones. The chief reason for this is an infection of Varroa mite, an external parasite. Other causes include Acarapis mites, a tracheal mite infection, pathogens, malnutrition, changing beekeeping practices and changing climate. Every year truck loads of bees are transferred in the US and Europe for the pollination of commercially important crops, such as almonds, berries, and watermelon. Globally, A mellifera forms the majority of these bee population. Manually moving the beehives from one place to another aggravates the spread of CCD even further. Although pests, diseases and pesticides have affected pollinators in a few pockets of the world, loss and fragmentation of natural habitats stand out as the single major reason for the decline in the abundance and diversity of pollinators. Studies show that with an increase in distance from natural vegetation, the diversity and abundance of pollinators declined drastically. General patterns across continents highlight the negative effect of habitat isolation on pollinators. While apiculture has always been practised in India, several government departments have been aggressively promoting it in the past few years. Their focus, however, is mostly on harvesting honey, not pollination. In a majority of discussions, the focus has been on the domesticated Asiatic honeybee (A cerana) and A mellifera, which are easy to rear and harvest honey from. Unfortunately, this means we neglect an array of native pollinators, such as rock bee, dwarf bees, bumblebees and stingless bees. A 2013 study published in Science shows that wild bees help increase yields of 41 crops under study across the world. This includes important commercial crops, such as kiwi, strawberry, watermelon, blueberry, mango, passion fruit, almond, cotton, buckwheat and coffee. There is currently a vast knowledge gap in understanding wild pollinators in India. This gap has widened due to the lack of research on insects in general. As the protected area-centric conservation strategies are heavily skewed towards large charismatic animals, such as tigers, lions and elephants, insects in general and pollinators in particular remain neglected. This approach is the reason there is a dearth of entomology research in India. It’s time, the country’s policymakers and researchers turned their attention to insect-benefitting agriculture. Although Indian scientists have done some commendable work on entomology, pollination biology and ecology, there is a dearth of funding opportunities in these fields, and thus, deserves the government’s attention. I am hopeful that India will learn from the mistakes made by the West, and value these little creatures, pivotal to our existence. This is regarding the article “Let them be” (1-15 July, 2017). Although relevant from an ecologist’s point of view, the article seems lopsided to an apiculturist. It is undeniable that non Apis pollinator population has decreased. There are many reasons, including monoculture and extensive use of pesticides. Clearing wasteland and forests for apple cultivation decreases hibernating and breeding places, leading to a decline in the population. However, the expansion of Apis mellifera has not contributed to the decline in the population of native pollinators. Of course, there is some overlapping but there is always a resource partitioning due to the morphology of pollinators and flowers. During the 80s, a disease, TSBV had wiped out the native Apis cerama in North and South India. In the absence of any measures to control the viral disease, it was crucial to extend (domesticate) A mellifera in order to revive beekeeping. In fact, A mellifera was present in Himachal Pradesh since the 60s and was understudy for various subjects. The domestication of A mellifera was done scientifically and as a consequence, India became a significant honey exporter when there was hardly any honey for domestic consumption. It is not true that non- apis and wild pollinators are not getting the required attention. For instance, bumble bees and non-apis bees are the subject for studies by the Indian Council of Agricultural Research. The objective of the article was to highlight the importance of pollinators and valuable pollination service they provision and not for or against A. mellifera. Their role in pollination as well as honey making is not ruled out. However, there are definite advantages of having an array of native pollinators for a sustainable future. The role played by the certain scientific organization is much appreciated be it in rearing non-Apis pollinators or studying different aspects of pollinators irrespective of the tight budget and limited support from the government. However, the scale of this research is not matching the scale at which agriculture is expanding in India.